The place is an attraction by its imaginative design: accessible through a dark tunnel, with reflections of gold-fishes projected on the floor and waterfall-walls, it looks like somehow an aquarium: the dark marble on the floor is so shiny, that it gave us the illusion that it was covered with still water... The number 8, synonym of luck and wealth (due to its similarity in the pronunciations of the Mandarin word for "prosperity"), is omnipresent in the hand-made decoration items. The best handicraftsmen have been hired to design the dinning room which doesn't get at all what Westerners would call the « Chinese kitsch ». Good taste is everywhere... including in the plates. Our «Dim Sum Platter» featured a daily selection of 4 kinds of steamed and deep-fried delicacies. The very classic «Steamed Superior River Shrimp Dumpling in Fish Shape» was fine, though we could enjoy it anywhere else in Asia; we preferred the more sophisticated «Steamed Shanghainese Dumpling with Yunnan Ham Essence». The Chinese use Yunnan ham in steamed and stir-fried dishes, and to create superior soup stock; its essence gave a salted, sour aromatic taste to our dim-sum. The «Vietnamese Spring Roll with Crabmeat and Black Fungus», another classic, was lighter and better than in the small restaurants where it is prepared with less crabmeat and much more palm oil. We our platter with the interesting and palatable «Deep-fried Abalone Puff, Stuffed with Black Mushroom and Asparagus», which looked like a «Samosa». Crispy and mouth watering. Though most of clients come for the dim-sum, usually booking large tables for the whole family, the Western visitor will be more attracted by the meals which followed and which, definitely, brought the Michelin stars to The Eight. The «Poached Fish Mousse Soup with Bamboo Piths and Bean Curd», is an upgraded, traditional fish-balls soup, with a more pleasant, smoother texture. We enjoyed very much the «Steamed Crab Claw with Ginger and Vintage Chinese Wine», which is a signature. Ultra-light, with a discreet taste of aphrodisiac ginger. Recommended, indeed; the same goes for the smoothly textured «Steamed Japanese Bean Curd Pocket Stuffed with Imperial Fungus and Sea Moose»: 100% vegetal, poor in calories, and ideal for a gourmand diet... We must say that, until then, our appetite wasn't totally appeased. The «Fried Rice with Diced Gammon Ham and Sea Whelk» came therefore as a pleasant surprise. Garnished with Fried Shredded Conpoy (= a sort of dried scallop »), served in unmatchable price a generous portion, this is a familar Chinese speciality. A great, traditional dessert, the «Almond Sweet Soup with Bird's Nest» pleased our spoiled palate. Fragrant and delicate, this is one of our favorite Chinese desserts. We liked very much the concept of The Eight. This is an «open restaurant» which everybody can afford: it was of course totally full the day of our visit (reservation is imperative), with an entertaining social mixture: gamblers, tourists, local families and businessmen. All communicating under the auspicious of gastronomy. DON ALFONSO 1890 (*****L): A top luxurious transposition in the Far East of the best restaurant in Southern Italy, Don Alfonso 1890, in Sant'Agata sui Due Golfi, between Sorrento and Positano. Honoured with the Wine Spectator Grand Award, this swank «trattoria» is considered as the most authentic Italian gourmet table in Macau. Chef Alfonso Iaccarino inherited from his ancestors, expert in cuisine and hospitality since 1890, three principles: acting for a cuisine presenting a strong Mediterranean character, absolute quality in raw materials, and modernity. A determined defender of the flavors, colors, and products of the Sorrentine Peninsula, Iaccarino continues the family art of sublimely catering for and hosting guests who wish to experience Mediterranean haute cuisine, accompanied by refined and courteous hospitality. The kind of chef who does not hesitate to leave his cuisine, peep in the dinning-room, and talk to his guests without any kind of protocol. He was in Macau the day of our visit, cautiously taking a personal and humble care of everybody in a full restaurant. This was a good approach for a pleasant gourmet experience. 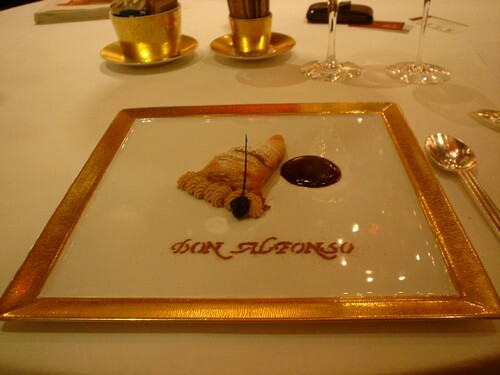 The «Don Alfonso 1890» at Grand Lisboa hotel doesn't look like a confirmed copy of the Sant'Agata original restaurant; it displays a sophisticated luxury, characteristic of a five star palace hotel and casino. Obviously a major investment by the Sociedade de Turismo e Diversões de Macau: spacious, decorated with Murano glass chandeliers, hand-painted majolicas typical of the Sorrentine Peninsula, glossy parquets, with that extra cool air-condition distinguishing in Asia the upper-class restaurants where you must wear your jacket (and maybe also bring a pullover...), «Don Alfonso» is so chic! As a contrast, the palatable dishes brought to our table in Bernardaud from Limoges sumptuous gilt porcelain dinnerware, were as simple as the real South Italian cuisine should originally be. Fish, vegetarian and meat-based Alfonso Iccarino's specialties all come with superb extra virgin olive oil drizzled on top. Infusion into the food the original taste of Italy. Iccarino is also an organic farmer: using ingredients produced in his property in Termini, where he grows up and transforms olives, lemons, tomatoes, fruit, and vegetables into oil, other products, and excellent preserves which are now exported worldwide. 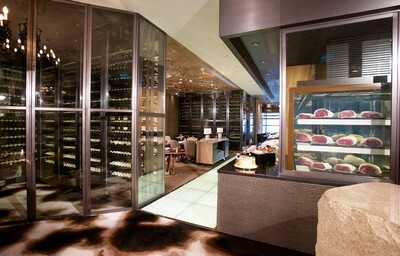 The «Lunch Menu» concentrates some of Iaccarino's specialties at a modest price (HK$ 380 / EUR 40 for 3 courses with dessert). 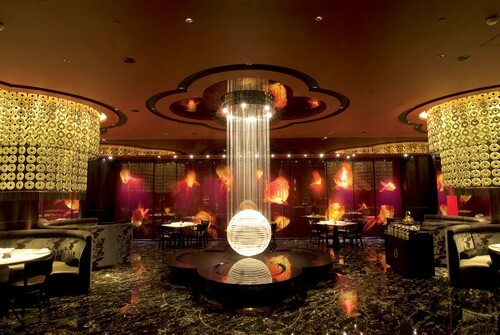 Portions are generous, and this is one of the best offers in Macau for a top notch fine-cuisine. This menu is updated on a very regular basis, based on fresh seasonal ingredients only. After a refreshing amuse-bouche, sea-urchins and small scallops on a cloud of squid ink, we have been presented with our starter: «Crunchy Cannelloni of sweet Paprika». Stuffed with salted cod fish mousse, caviar (from China: excellent! ), bellpepper foam and capers sauce. It couldn't have been better in Sant'Agata. The richly iodized caviar left a characteristic savor in our mouth, pairing well with a glass of Chardonnay. Roberto Gallotto, the Italian sommelier, didn't even brought us the telephone book sized wine list (200,000 references of beverages and 7,400 wine labels concentrated in an Ipad!) and straightly advised a «Cova da Ursa Chardonnay 2008», from the Portuguese Península de Setúbal. Ideal with cod, it comes with a intense, fruity savour of matured mango and toasted caramel. It was fine also with the pleasantly rustic «Cream of Tomato from Campania», with striped red mullet and oregano from Punta Campanella. Pasta is serious matter, and Iaccarino kept a close eye on the preparation of our timed-cook, al dente «Traditional home-made Fusilli», with Mediterranean clams and zucchini. Just perfect: tailor-made for a pasta aficionado. We already felt quite full when the mouth watering «Kagoshima Beef Tenderloin & Puffed Spaghetti with Trio of Sauces (green olives, San Marzano tomatoes and horseradish )» came to our table. The most tender part of this delectable black beef, on a constant diet of sweet-potato-and-alcohol mash, is the base for the finest meals in Japan. No need to be the most learned of bovinophiles to appreciate this delicacy which is amazingly palatable cooked the Italian way, with more thrills and aromas. Simply great with one glass of Chianti «Ruffino, Reserva Ducale 1997»: complex and elegant, this «vino di meditazione» is ideal to accompany richly flavored foods such as roasts and game. If the dessert weren't included in the rich, generous menu, we should have dropped the «Hot Soufflé with Lemon Liqueur» (which should have been a pity, finally, as this is a Don Alfonso's signature and best seller); the confectioneries served with the Caffé Passalacqua (certainly the finest quality espresso product available in the world market today, it is available in all the Grand Lisboa and Lisboa bars and restaurants) tasted like the icing on the cake. After such a remarkable, splendid for value lunch, one simple question came up to our mind: why does the highest Michelin-rated (2-star) restaurant in Southern Italy, under the strict control of Iaccarino and his Italian staff, with the nec plus ultra Asian touch provided by a remarkable service, miss the merited Michelin distinction in Macau? Open for Lunch 12:00 – 14:30. Dinner 18:30 – 22:30. LA PALOMA (*****): Visiting La Paloma duplicates the pleasure. First of all, it gives you the exciting opportunity to discover the one and only five star boutique hotel -and oldest hotel!- in Macau: La Pousada de São Tiago. Then, sitting at the terrace, berthed by the music of the fountain springs, in the shade of centuries-old trees, this is the ideal, most romantic place in Macau to taste an authentic and wealthy Iberian cuisine. We love Spain, and Chef Hector Costa's cuisine concentrates, with a note of modernity and luxury (we will describe later his lucculeous Lobster Paella...) on the ignored diversity of the Spanish regional cuisines. Hector comes from Barcelona, the new European gastronomic hub; but his specialities smell and taste like "Manchegas ", "Galicianas " or "Bascas ". The Iberian patrimony was here, on our table, transported in our ravishing deep blue and gold plates, and poured into our crystal glass. There is no Spanish lunch -or dinner- without "Tapas ": those "amuse-bouche ", served with a glass of wine or aniseed alcohol, are part of the Iberic civilization. A tradition inherited from the Arabic invaders, who introduced their "Meze" to the the peninsula in the 8th Century. It goes from the modest fried potatoes with garlic, till the aristocratic dried ham "Jabugo". We weren't surprised, in this top end restaurant, to be served a nice portion of the best "Jabugo" ever: the "Pata Negra Bellota" (=black leg), from the Valle de los Pedroches, close to the historic city of Cordoba. Dried 28-30 months in a region which kept its eco-system totally virgin, this is certainly the finest -and most expensive- ham in the world. It came with crispy, aromatic tomato bread, on which we poured some drops of D.O. Montsant Arbequina oil emulsion, made in Catalonia from freshly pressed Arbequine green olives. We ordered a Portuguese red wine “Convento Da Serra, Vinho Regional Alentejano, 2008” (MOP 55 / EUR 5 by the glass): with characteristic lifted fruit characters of pineapple and grapefruit. A fine regional wine, extracted from the 650 references of the rich wine list. The “Piquillo Spanish Red Peppers”, stuffed with “Bacalhau” (=cod), are also a regional speciality, originated from Navarra and Basque Country. So creamy it looks like a veloute. This is one of Hector's signature dishes. The “Crispy Baby Pork” (or “Cochinillo Asado”), served as a main dish, is one of the most typical dishes in the cuisine of Castilla. Served like in Segovia, with apple compote, roasted tomatoes and potatoes, this dish is very popular with the Asian guests. It looks and tastes like the Chinese Roast Suckling Pig, and we experienced almost the same dish in a local restaurant; without the Mediterranean savor, of course, which came here as a bonus. The must remains the superlative, and pantagruelian “Lobster Paella, with Clams, Mussels, Shrimps, Squid, Chorizo, Onion & Bell Pepper”. We got a family portion of the best paella ever enjoyed, indeed... and ate much of it, though we felt already full like a stone. Tastier than in Madrid “Paella Club” or Valencia “El Forcart”, it came topped with so much delicious seafood... One big lobster has been used to make it so royal. Next time we visit La Paloma, we go straight for it and nothing else: it could feed a small country! The dish was simple; the ingredients were fresh and splendid: this is the cuisine we like. We paired our paella with a well chilled, aromatic white wine from Portugal: “Convento da Serra, Vinho Regional Alentejano, 2008” (MOP 55 / EUR 5 by the glass). After such a healthy dinner, a light dessert sounded imperative: we have been very satisfied with our “Copa of Chilled Strawberries in Emulsion of Passion Fruit, Lemon and "Cava" (Spanish sparkling wine)”. This cool, refreshing sorbet helped very much our digestion. Excellent service! The waiters kept a close eye on each guest (mostly Europeans the night of our visit: certainly because the hotel is a Relais & Châteaux): he spontaneously brought some refreshing towelettes on a silver tray, seeing that we were peeling the lobster legs with our fingers. Price for a fine dinner is about MOP 700 – 900 (EUR 70 – 90), without wine. The recommended "Lobster Paella", for 2, costs MOP 420 (EUR 42): which is extremely reasonable. A nostalgic, colonial restaurant, in the unique Relais Châteaux in China, is also one of the most prestigious addresses in Macau. THE KITCHEN (*****): Much more than a top notch steak-house, this sophisticated, high tech restaurant with an informal vibe is also a salad & sashimi bar... animated in the evening by a Portuguese accordionist playing French ballads. Could it be more international? Hostesses standing behind a gold brushed metal bull bar welcomed us with much courtesy, seating us in the intimate room, close to the open kitchen and grill. No smell at all: the smoke is efficiently vacuumed, and the air goes almost sterile. The beef, just like all the ingredients used by the chef, is imported from Australia, USA and Japan. The Japanese sashimi are air flown in twice a week. Even the salt and pepper are imported from Hawaii and Borneo! 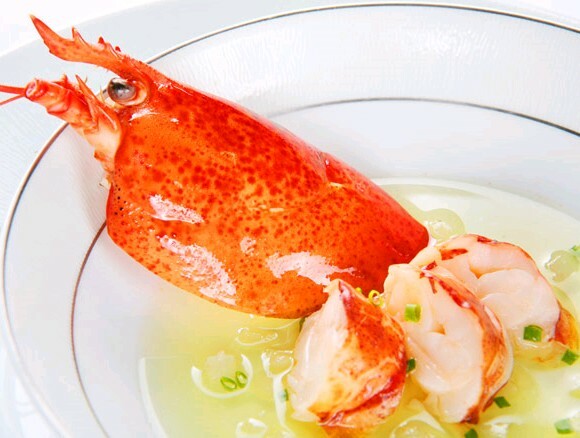 Regular guests like to choose their favorite cut of meat from a glass display, or lobster from the tank, enjoying an aperitif or appetizer until it gets ready. We chose the small «Seafood Pancakes with White Wine Cream Sauce» (MOP 180 / EUR 18), stuffed with shrimps, surimi, mushrooms, scallops, and slightly gratinated. Yummy! It paired well with a glass of Champagne «Bruno Paillard, Brut, Première Cuvée» (MOP 180 / EUR 18). Our certified prime beef from the USA «New York Sirloin» was amazingly tender and ideally grilled. We recommend to order a 10 oz. / 290 gr. portion (MOP 450 / EUR 45), as the meat is always accompanied by a rich sauce (the mouth watering wild mushrooms stew sauce is succulent) and Idaho potatoes, spinach and asparagus. Karen, the lovely French «sommelière» suggested a glass of South Australian «Clarendon Hills Shiraz Liandra, 1998» (MOP 170 / EUR 17): drinking well, spicy, with tobacco and oak nose, it could have been a Côte-du-Rhone with its long, smooth finish. The bread selection was great: home-made, and served hot from the oven, it also featured... a couple of chocolate brioches! We tasted it just for the pleasure: the meals at The Kitchen came to our table in such generous portions that it was superfluous, indeed. It was impossible to leave without tasting the well worth the try Tatin like «Pear Tart with Vanilla Ice Cream» (MOP 90 / EUR 9)... and visiting the bling gents toilets, where the wash basin, when used, activates 2 transparent money booths which swirl round HK$40,000 into the air! No doubt: you are in Macau! Note that this high end steak-house is particularly affordable at lunchtime , with an offer at MOP 300 / EUR 30 only, featuring salad or soup + steak + dessert and coffee. What else?! Open for Lunch 12:00 - 14:30. Dinner 18:30 - 22:30. AUX BEAUX ARTS (*****): Located on the wonderful Praça Grande, in the splendid hotel-casino MGM Macau, this traditional European restaurant pays tribute to the 1930’s Parisian «brasseries». Lebanese Chef Elie Khalife brought a decade of experience from the finest kitchens in Paris, where he trained with Alain Ducasse and Paul Bocuse, to create a contemporary cuisine with a classic note. The service is a little bit approximative for a five star hotel (poor English), but remains efficient and really friendly. The «Tasting Menu» (MOP 540 / EUR 55 the day of our visit) proposes a nice selection of French inspired specialities, served in decent portions. The «French Snail on Tomato Fondue, Parsley and Garlic Butter and Golden Crouton» and the «Chestnut Soup with Smoked Duck Breast, Shaved Foie Gras, Truffle Foam and Baby Crest» are actually representative of what one could expect in a Parisian brasserie. The other dishes, though delicious, are much more on the international hotel coffee-shop style, and the selection of cheese (Comte, Brie and Saint Maure) quite limited: Roquefort, Livarot and Crottin de Chavignol, which are favorite on a French table, should be part of it. Excellent dessert («Quince Foam in White Chocolate Cannoli, with Raspberry and Caramel»), by Günther Wolfsgrubert, the Austrian Pastry Chef . The wine list is extensive, though of course quite expensive; a glass of pleasant Californian or Chilean wine starts from MOP 50 (EUR 5); little more for a Bordeaux or Chianti. We liked very much the atmosphere. 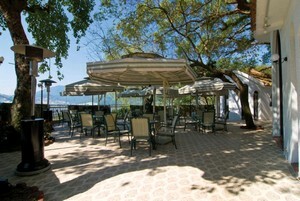 The warm dinning room, the pleasant, romantic sunlit terrace on the Praça Grande will certainly make us come back. Open Monday – Friday 14:00 – midnight, 11:00 – midnight (Sun/Public Holidays). CLUBE MILITAR DE MACAU (****): A democratic alter ego of the Cercle Interallié in Paris, or Foreign Correspondent's Club in Hong Kong, this membership club opens its restaurant to the adventurous gourmet who finds here the most atmospheric and historic dining hall downtown. Since 1870, this recreational Portuguese military officers' pinky baroque building, one of the most impressive colonial landmark in Macau, displays a homey, languid old-world atmosphere which we don't find that much in Asia anymore. Half way between the Raffles Singapore and the Continental Hotel in Saigon, the dining hall is a non-touristic reminiscence of what the Western influence in China looked like one century ago: high ceilings with fans, glossy wood paneled floor, large arched windows, turn-of-the-century furniture, bridge tables and grand piano... despite of the up and down of the institution, on verge of bankruptcy between 1980 and 1990, nothing changed in this living museum of gastronomy. The Portuguese and Macanese cuisines served in the club are both excellent. Don't expect invention or avant-garde. The club is not the place for sophistication; but for an authentic, traditional family cuisine, with all those classics we experienced in small rustic «pousadas» in Lisbon, Porto or Coimbra. With that little spicy note showing that you are actually visiting Asia. You may check the daily offer, on display at the gate of the well lit, animated and quite noisy dinner-room. Appetizing and cheap, it concentrates on popular Portuguese dishes featuring cod, pork, chicken and squids. Just expecting you will be lucky enough to get seated by the Spanish -but not Portuguese...- speaking mainly Filipino staff. It is usually packed with many Westerners -lots of foreign residents based in Macau and Hong Kong- and a small dozen of Asian gourmets, who booked a few days in advance. This colonial ambience made us pleasantly travel backwards in time for a handful of Patacas. It is of course possible to order «à la carte», for a larger selection of attractive dishes; but we recommend the «Service for Two» set lunch menu (MOP 456 / EUR 45), which is updated every month with fresher, season ingredients. The day of our visit, it featured «Caldo Verde»: this green broth, originated from Northern Portugal, is made with potatoes, onions, kale, garlic and slices of «Chouriço». Simple and light, it is traditionally consumed before a main course meal: a crispy, mouth watering «Leitão à Moda da Bairrada com Molho do Seu Assado» (Roasted suckling pig "Bairrada" style), served in a generous portion, accompanied with «pala-pala» potatoes, tomatoes and oregano. Our dessert was a «Prato Variado de Doçaria Conventual Portuguesa» (Assorted traditional Portuguese dessert platter), featuring a mild «Pastel de Nata»: the famous egg custard tart (called «dan ta» by locals), quite recently introduced in the region (1940's), but nowadays 100% part of the Macanese (but also Hong Kong) cuisine. Consisting of an outer pastry crust that is filled with egg custard and baked, it has to be experienced in Macau where nobody does it better, indeed. The wine list is attractive, and good value for money for those who like the characteristic «Vinho Verde» (pairing with seafood, eggs and spicy vegetable), which starts from MOP 99 / EUR 10 by the bottle. There is also a fine, strong red wine from Douro, which we recommend: «Lavradores da Feitoria, 2006» (MOP 158.00 / EUR 16). This romantic gourmet restaurant is also ideal for those on a family trip.